1 Melt Country Crock® Spread in 12-inch skillet over medium-high heat and cook onion, stirring occasionally, 5 minutes or until tender. Stir in rice and cook 1 minute. Stir in water and 2 teaspoons Knorr® Chicken Bouillon and cook covered 10 minutes. Stir in corn and cook covered an additional 10 minutes or until rice is tender. 2 Fluff rice with fork, then stir in poblano peppers, remaining Knorr® Chicken flavor Bouillon and 1 tablespoon Hellmann's® or Best Foods® Light Mayonnaise. Combine remaining Mayonnaise with crema in small bowl. 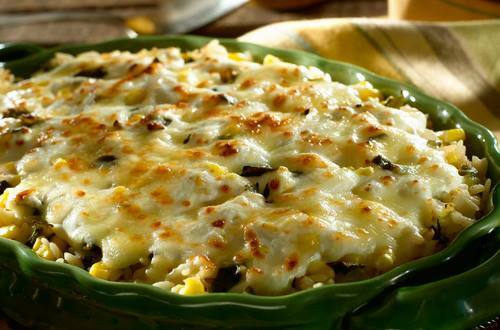 3 Turn rice mixture into 7 x 10-inch glass baking dish, then top with mayonnaise mixture and sprinkle with cheese. Broil 4 minutes or until golden and cheese is melted.